Sweet P made this as a gift for Gammie for her birthday. It's right up Gammie's alley and perfect for the Easter season. It was such a simple craft and it looked beautiful in the window! We sent it to Gammie so now we need to make one of our own! Cut a cross frame out of the card stock. I folded the card stock in half to cut it and it was much easier than trying to make the ends the same size. 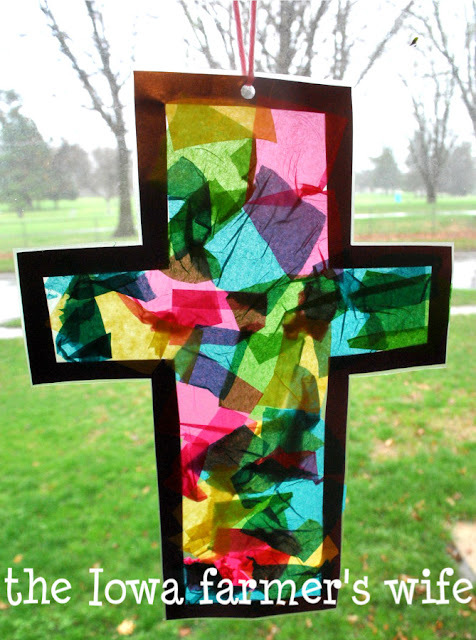 Cut contact paper twice the size of your cross (you'll need it to cover both sides), then cut the contact paper in half. Affix the cross onto one piece of the contact paper and cut around the edges so that the only sticky part is in the middle of the cross frame. Cut small pieces of tissue paper (child can help with this if scissor-aged), then have your child stick the tissue paper onto the contact paper until covered. Place the other piece of contact paper on top of the finished product and cut around the edge of the cross. Hole punch the top and thread a piece of yarn through the hole. Tie off the yarn and hang in a window. A great sensory project both when creating and admiring!